The fine pipe organ in Christ Church was built in 1907 by James Jepson Binns of Leeds . It cost precisely £953 6s 0d including the electric blower motor and the case. To put that in context, the master craftsman responsible for roofing the church building in 1905 was paid 10d per hour which in today's currency is just £2.35p per week or £122.64p per year. So the organ cost the equivalent of 8 years of his wages! It has been valued today at £208,000. The organ is not large but it produces a fine tonal range and is well matched to the building. James Jepson Binns perfected his own patented Interchangeable Combination System and used it in many fine organs. This enabled the organist, while still continuing to play, to alter the sound the organ is producing by adding or subtracting different ranks of pipes using a set of mechanical foot pedals. Over the years many organs that originally used this system have been altered. Modern electrical systems have replaced the rather heavy mechanical movement. So the organ in Christ Church is one of very few in which Binns' patent system remains in good working order. After almost one hundred years of constant use the components of the organ were beginning to feel their age. Despite regular, careful maintenance things were starting to go wrong. The organ became unreliable and could no longer be used for recitals, teaching and practice. As a special project to mark the centenary of the consecration of Christ Church in October 1905 the Church Council decided that the organ should be conserved and restored. work began in August 2004 and was completed in 2005. 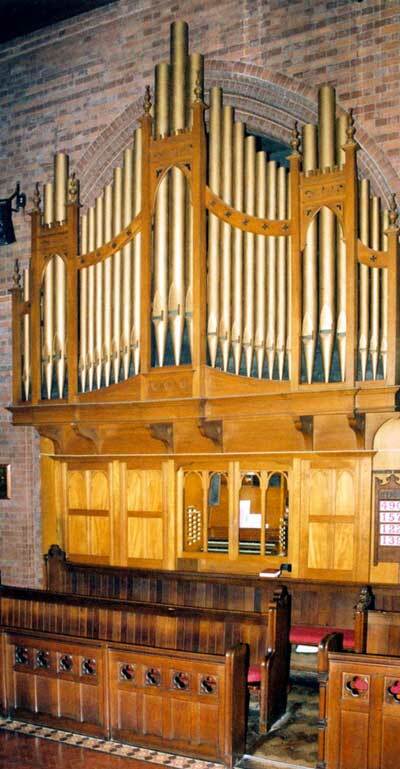 The project was supervised by Dr William McVicker and the organ builder was Mr Bernie Whitmill of Heritage Pipe Organs Ltd. The Parish Office, Christ Church Vicarage, Leggatts Way , Watford , Herts.